Reverse merger, or “backdoor registration” transactions, have long been a vehicle for private entities to access the equity markets. 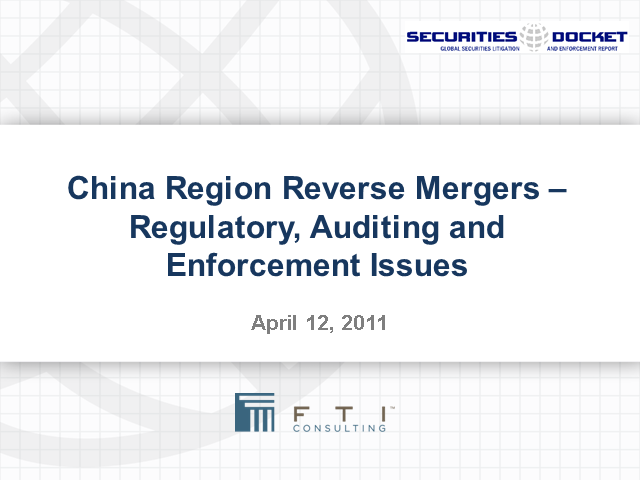 Recent, well-publicized concerns have drawn considerable attention to these reverse mergers, particularly with respect to abuses associated with certain transactions involving companies from China, Hong Kong and Taiwan. A variety of cross-border accounting, disclosure, auditing, reliance and access issues are at the heart of the debate. Current and meaningful initiatives are being pursued in a collaborative way by the Securities and Exchange Commission, the Public Company Accounting Oversight Board, NASDAQ and NYSE Amex to deal with these important subjects. Please join panelists Charles Clark, partner at Kirkland & Ellis LLP, and Marty Wilczynski and Jay Frankl, Senior Managing Directors – Forensic & Litigation at FTI Consulting, as they address these and other developments during a free, one-hour webcast.